Marine life across North America will experience a substantial shift northward over the next few decades, according to a new comprehensive report that looks at how climate change will alter the habitats of 686 marine species. "As water warms up in some places it allows fish to colonize," says Malin Pinsky, an ecologist at Rutgers University and co-author of the study. "But if it gets too hot, the species gets driven out of the region. This is something that we already see happening all over North America, all over the world." Pinsky says it's hard to say how far, how soon this redistribution of marine life will play out gradually over the next 80 years and could continue long past the 21st century, depending on what choices society makes in terms of reducing greenhouse gas emissions. It could also have big implications for California's iconic crab and salmon fisheries. Researchers at Rutgers University combined data from U.S. and Canadian government surveys that looked at where species have historically been found, with models from the Intergovernmental Panel on Climate Change that project future environmental conditions. They then did projections using both low and high estimates of future greenhouse gas emissions. Taking the lowest estimates into account, researchers found there will still be a substantial shift toward the North Pole, although it would reduce the extent of the shifts by one-half to two-thirds. Pinsky says "pretty much" all species would be affected, though not by as much as with higher emissions. "So from the perspective of fishing communities and fishing managers, there are real benefits to sticking to the Paris Accord," referring to the international climate agreement, from which the Trump administration has withdrawn. The projection models are particularly useful for California fisheries, where management decisions depend on a range of possible environmental conditions. "The rug is getting slowly pulled out from under coastal fishing communities," says Pinsky. "That may mean longer trips and higher fuel costs. For others with smaller boats, it may mean needing to find a new species to catch, which can be challenging because buying permits for new fisheries can be really expensive." Even when smaller shifts in marine life distribution have happened in the past, it has often led to conflict, he says. "It's something we see starting to happen, especially on the east coast. There have been ongoing debates about who should get access to species like flounder, black sea bass, all found in new locations." Habitats for some species will shift up to 900 miles north, including those that are crucial for California fisheries, according to the report. 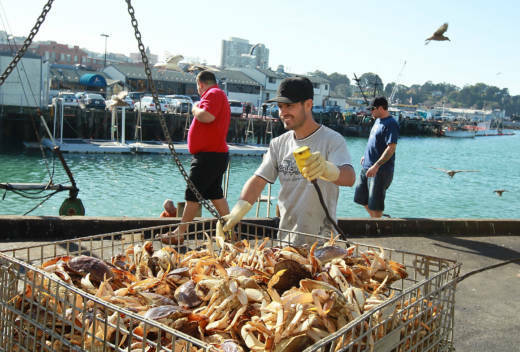 The Dungeness crab for instance, one of the most valuable fisheries in the state, is expected to shift up to 500 miles north. While the Chinook salmon, an important staple of California fisheries, is projected to move up to 200 miles north. In addition, a substantial decline in habitat availability for certain species is expected over time, says Pinsky. The Tanner crab, important to the Alaskan fishing industry, could experience a 95 percent decline in habitat. Pinsky says entire ecosystems could face disruption from the impact of climate change on marine life. "One of the things we know is that different fish and other animals shift at different rates," he says. "So it often means that a predator may lose one of its prey, or a prey may gain a new predator. So these changes are disrupting food webs as well. And it's quite hard to predict what the consequences of that will be." Pinsky says these developments are likely to lead to more surprises in the future. "At this point, climate change isn’t about uncertainty," he says. "Unfortunately, we actually have a lot of certainty especially towards the direction these species will shift. And that is almost entirely towards the north."